This post has been half written in my drafts forever! And I've recently had a few people asking for Stockholm tips so here it is! Definitely summer. Fall is cool and rainy, winter dark and cold, spring still not quite warm, so summer is definitely best! The whole 'sun doesn't set' in the summer thing is pretty magical as well. But be aware that a lot of businesses close down in parts of july because everyone goes on vacation. This last trip we stayed at two different hotels, one on the first part of our trip, and one on the end. Both were amazing! J Hotel was probably the favorite. Its a bit out of the city, right on the water and SO freaking gorgeous. Its a bit more remote, but the main bus line in a 5 minute walk from the hotel, there were restaurants and shops right there PLUS a ferry boat comes right to the hotel dock all day and takes you into the city in just 20 minutes. Such a fun public transportation mode with kids. They Loved it! We used that almost every day. Another bonus was the hotel had a balcony for us to hang out on after we got the kids to bed. Hotel Stureplan was the second hotel we stayed at. This one is Right in the middle of the city and all the action. A super old building that was also really charming. 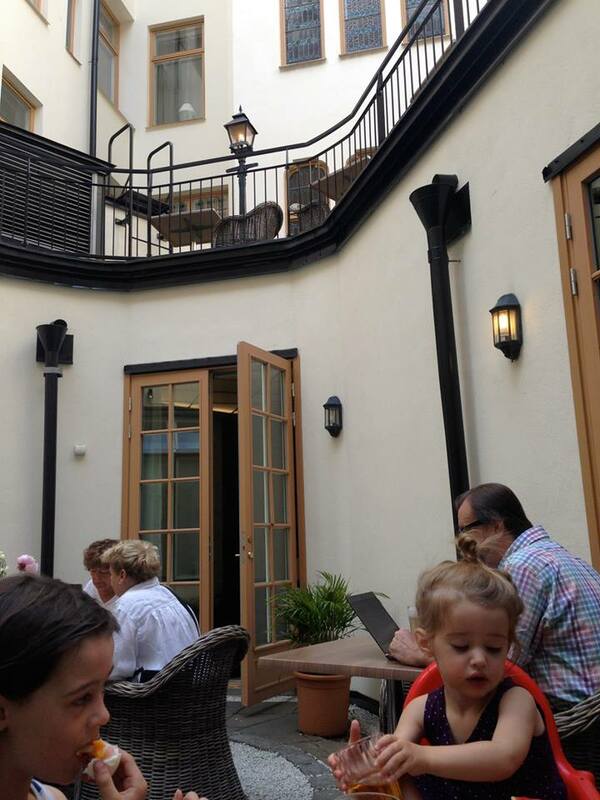 The breakfast was in the courtyard every morning which was super cozy. We didn't have to take any transportation while staying there because it was so close to everything and we just walked everywhere. One amazing thing about this hotel was that right outside of our room was a big common area room with couches and tables, super cool antique looking furniture. So after we would get the kids to sleep in the room we would sit there in the lobby and eat, watch House of Cards on Netflix and relax, all while we could see the room and hear them with the door cracked. It worked out so great! Skansen is a Must for all ages. Its a an open air museum/zoo all in one with an amazing playground and great food all in one. In the summer they have concerts there as well. You could easily spend an entire day there. Junibacken aka Worlds coolest children museum. The whole museum is based on characters and scenes from Astrid Lindgrens books, and I had goosebumps the entire time I was in there. Theres even a ride that takes you through scenes of the books and ends with Pippi's life size house where you can play in (adults included!) They also have a great cafeteria style restaurant in there so go in the morning, play for a few hours and have lunch!. Its on the same little island as Skansen and other museums. When we went it was raining so we did the morning at Junibacken, had lunch, and then walked next door to the Vasa Museum for the afternoon. Vasa Museum is another must. Its a ship that sank just a mile or so from the harbor and after 333 years in the 60's I believe, they pulled it up fully intact. This museum is dark and cool and we planned this one for nap time for Tindra (2 at the time) and it worked perfectly. She fell asleep in the stroller on the walk over and napped pretty much the entire time in there because of the dark. Drew walked around pushing her and reading all the millions of signs while Jasper and I explored at a faster pace because what 6 year old wants to stand around while his parents read. But it was enjoyable for everyone! Another super fun thing to do, with kids or without! Take a boat ride out to fjaderholmarna Its about a 20 minute boat ride from the city center. Its a tiny island with an ice-cream shop but not much else, so grab a baquette and some cheeses and make a picnic on the 'beach' Its more like big smooth rocks, but its such a fun way to spend a summer afternoon. Another fun thing we did was take a boat ride out to Drottningholm Castle. Actually we took the subway out to the castle, walked through the castle and grounds and then caught the ferry back to the city. The castle in the 'old town' area of Stockholm is also awesome to see and now part of it is also a museum. Also fun to see the changing of the guards there! You could spend all day at the castle and shopping in 'gamla stan' (old town) there also. Kulturehuset in Stockholm is also really cool to visit. The top floor of the building is THE coolest kids library I've ever been in. They also have a cool art room you can pay a super small fee to get a little craft kid. We could have spent hours and hours here also. Another fun thing we did was take a boat tour around Stockholm, we wore headphones that gave a ton of history, and being on the water was so much fun for the kids that they let us sit there and listen/enjoy it also. For the best views in all of Stockholm, go up kaknastornet. Go up there and grab lunch or fika! Since Stockholm is all on the water, you have to take a day to get In the (freezing) water. Theres tons of little beaches around, and I wish I remember the way to get to the one we did, but we took a train out to the suburbs and walked through an amazing part and ended up on a public beach that had a great ice cream and hot dog stand. Probably the kids favorite thing we did there! Don't try telling them the water is too cold! Theres SO much more to do in and around Stockholm, these were just a few of our favorites! There are endless parks, shops, restaurants and museums to visit. And you don't need a car for any of it! Sweden has some of The best public transportation in the world. Boat to Gotland. We did this with friends, honeymooning together 8 months after our wedding and days after theirs! It was an amazing time and I can't wait to go back! We went camping on the beach, but there are hotels/cabins/airbnbs also. The town has a medieval wall around it and is so freaking cool! Dalarna is another awesome region to visit. We met friends there with Jasper when he was a toddler, rented a little stuga and went to the theme park they have there. I'm sure theres tons more there to do as well! I could go on and on and onnnnnn about things to do in Sweden, places to visit. Next time we go I want to see more of the south!